VARCO interior doors bring charm and style to any home. From flat panel, raised panel, french doors, louvered doors flush doors, and pine doors to custom door options. 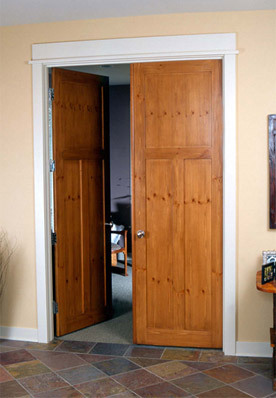 Our doors are beautifully finished and built for durability while adding value to your home. With both elegance and durability, our door hardware makes the right first impression. Choose from our wide selection of finishes and solid hardware to customize your door. Whether you need a special door, special mounting options, a non-standard panel configuration or an unusual veneer, VARCO will work with you to achieve precisely the appearance and performance you need.